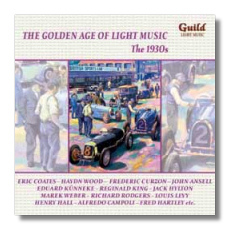 This is yet another delightful compilation from the Guild stable dedicated to the emergence of the genre of British Light Music as a recorded medium in the 1930's. As with previous issues in this series, the popular mixes with the unfamiliar and the recordings themselves have been excellently remastered so enjoyment is surely guaranteed. I am a passionate fan of Haydn Wood's music so I was more than thrilled to hear two of my favourite items, the lovely 'May Day Overture' and 'Curtains Up', both excellently played by Wood and Charles Shadwell with different orchestra. Another perennial favourite is Curzon's 'March of the Bowmen' from his 'Robin Hood Suite' which is also very well played by the London Palladium Orchestra under the baton of Clifford Greenwood. There are quite a few rarities here however, mostly in the shape of composers such as Edward Kunneke and Leon Jessel whose 'Wedding of the Rose', I had not heard before and which is definitely charming. Eric Coates, Richard Rodgers and a great 1937 movie medley give the disc a sort of cosmopolitan feel to the compilation. David Ades writes some excellent notes and the project deserves continued encouragement for its capacity to unearth some long lost recorded treasures from the dusty archives.